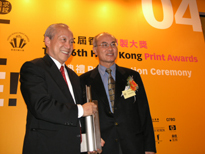 2004 HKPA Honour President, Mr. Ho Ka Hun, was awarded at "The 16th Hong Kong Prints Award Presentation Ceremony". HKPA's Executive Committee met Mr. Mak Lik, chairman of Democratic Alliance for Betterment of Hong Kong, to have discussion about HK Politicial Restructure. With arrangement by Mrs. So Chau Yim Ping (Vice-chairman Supervisory Committee), HKPA's executive committee met Ms Elsie Leung, Secretary for Justice of HKSAR, to discuss constitutional reform in HK. 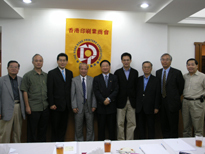 Representatives from HKPA and Hong Kong Publishing Federation Limited were invited by Mr Stephen S.L. LAM, JP Secretary for Constitutional Affairs, to discuss the constitutional development of HKSAR. 2003 Mr. Yip Yu Bun, the Hon. 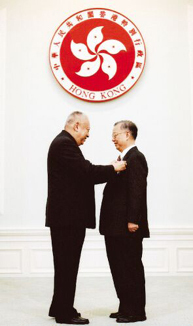 President of Hong Kong Printers Association won the Medal of Honor on October 11, issued by the Government of Hong Kong SAR. Mrs. Fanny Law Fan Chiu-fun, the Secretary of Education and Manpower acted as the honored guest for the Inaugural Ceremony of the 33rd Directors and Supervisors and the 64th Anniversary Party of Hong Kong Printers Association. C & C Joint Printing Co., (H.K.) Ltd. won more than 50 awards in USA, including 3 Benny Award issued by PIA; 1 Golden Prize of American Golden Ink Award; 5 IAPHC awards; 1 Golden Prize of SAPPI Trading and obtained to become a member of Publishers Marketing Association. 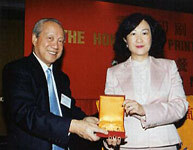 2002 Forbes chose Hung Hing Printing Group Limited as one of the most outstanding small enterprises. Midas International Holdings Ltd. has won 3 Certificates of Merit, issued by PIA. In September, on the 11th VIP Lunch of Hong Kong Printers Association, we have invited Ms. Ye Liu Shuyi, the former Director of the Security Bureau of the Government of Hong Kong SAR. C & C Joint Printing Co., (H.K.) Ltd. won more than 40 awards in USA, including Best of Category, Best of Show and Ben Franklin Award issued by PIA and 2 Golden Prizes of American Golden Ink Award. 2001 Forbes chose Hung Hing Printing Group Limited as one of the most outstanding small enterprises. Midas International Holdings Limited has won 2 Awards of Recognition and 3 Certificates of Merit issued by PIA. Mrs. So Chau Yim Ping, JP, (Newisland) the Vice-chairman Supervising of the association won the Bronze Bauhinia Star issued by the Government of Hong Kong SAR. C & C Joint Printing Co., (H.K.) Ltd. won the Good Manpower Management Award (2001) issued by the Labor Department of Hong Kong. C & C Joint Printing Co., (H.K.) Ltd. won 1 Golden Prize of American Golden Ink Award; 5 IAPHC Golden Prizes and 2 Champions of "Publishers Association of the West". According to official statistics, quantity of employment, gross value of production and added value of paper, printing and publishing industry rank the top of Hong Kong manufacturing industry; number of firms/organizations of paper, printing and publishing industry rank the second of Hong Kong manufacturing industry. 2000 Mr. Tung Chee Wah, the Chief Executive of Hong Kong SAR granted an interview to the representatives of printing industry at his office on June 10. Besides finding out the history and current situation of Hong Kong printing industry and the urgent need of well-educated printing talents, he put forward many relevant problems and valuable suggestions. Midas International Holdings Limited won 5 Pewter Award Certificates. C & C Joint Printing Co., (H.K.) Ltd. won 1 Champion of Colorado Book Awards; 2 Golden Prizes of American Golden Ink Award; 5 IAPHC Golden Prizes. According to official statistics, number of firms/organizations and quantity of employment of paper, printing and publishing industry ranks the top and the second of Hong Kong manufacturing industry respectively. 1999 Forbes chose Hung Hing Printing Group Limited as one of 300 most outstanding small enterprises in the world. 1998 According to official statistics, number of firms/organizations, quantity of employment and added value of paper of paper, printing and publishing industry ranks the first and the second of Hong Kong manufacturing industry respectively. 1996 Midas International Holdings Limited listed on Hong Kong' stock exchange. 1994 New Island Printing Co., Ltd. obtained the Certificate of ISO9001. 1993 New Island Printing Co., Ltd. listed on Hong Kong' stock exchange. 1992 Hung Hing Printing Group Limited listed on Hong Kong' stock exchange. 1991 Leefung Asco Printers Ltd. listed on Hong Kong' stock exchange. It is the first printing enterprise listed Hong Kong' stock exchange. You are always welcome to notice us with relevant certificates.